Singapore-Darwin-Sydney, HMT Arawa, Sydney-Melbourne by troop train, Melboume-Fremantle, HMT Strathmore. Escaped from Changi with Lieutenant Penrod Dean. Captured 6/4/1942 at Pontian Keechil in Johore State by Malay Police and handed over to Imperial Japanese Army on 7/4/1942. Sentenced to two years solitary confinement at H.M. Prison, Outram Road. The Cat and the Canary – A Japanese prison guard creeping up on an unsuspecting prisoner in his cell. The Sky Patrol – Left Singapore a little too early. He Stayed for Breakfast – But disappeared as soon as he learned there was more rice for dinner. Gone with the Wind – That extra ration of rice! John McGregor was 38 years old when he enlisted. 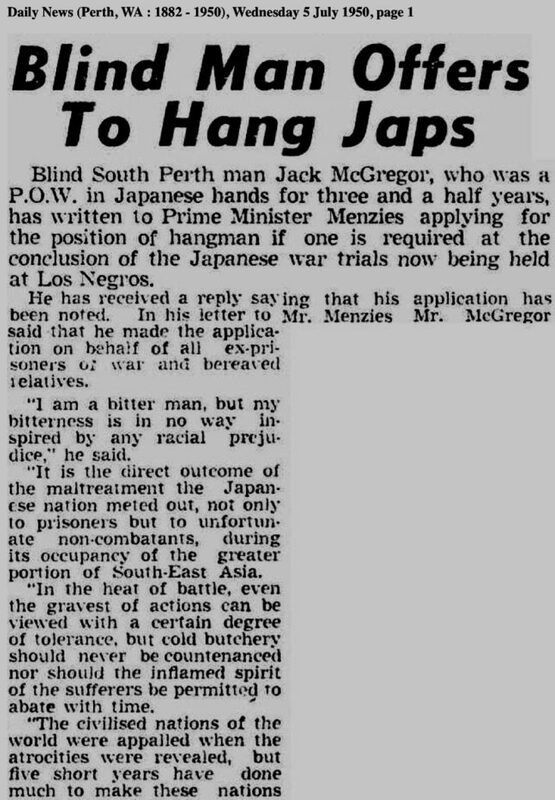 He, like many thousands of men was bitterly disappointed when the Allies surrendered and 8th Division found they were POWs of the Japanese. He wrote a book about his years in Outram Gaol “Blood on the Rising Sun” describing his experience where most men in solitary confinement drifted into ‘merciful death or were pushed there by the swift sword of the Japanese’. John was one those to survive his hellish ordeal. McGregor’s parents Charles Hutton and Clare Jane Shipton married in Sydney, NSW in 1890. It is not known when the McGregor family moved to WA, and John Alexander was born in 1903 at Guildford. It is not known if he had siblings. He resided and worked in Fremantle as a waterside worker during early 1930s. 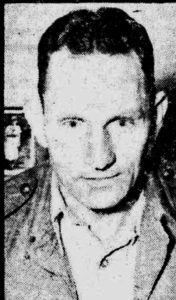 He married in 1926 to Henrietta (Vetta) Roberta Dixon and they had at least one son Kevin who died in 1966. 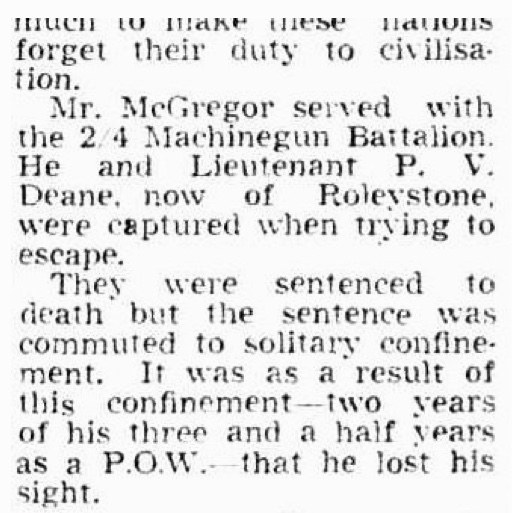 McGregor’s mother died in May 1941and it is doubtful he discovered this until after the war. 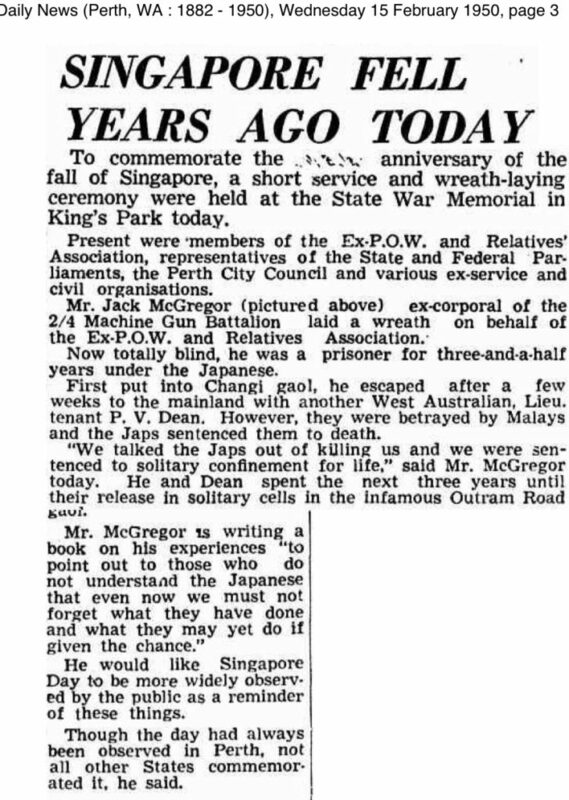 Sadly his wife Vetta McGregor died in November 1945 a month after returning to Perth. 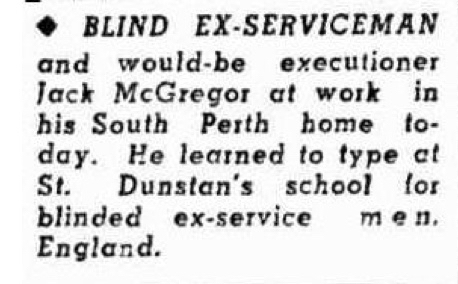 His father Charles Hutton McGregor died in Perth 1955. It is thought John and Annie had at least one child. Annie died 2003 in Western Australia and John McGregor died on 21 September 1981, Sydney, NSW. It is not known when John wrote the story of his experience at Outram Road Prison in his published book “Blood on the Rising Sun” which was published by Bencoolen and printed in Hong Kong by Gareth Powell Limited 1980. John ‘Jack’ or ‘Mac’ lost his sight whilst at Outrim Gaol. Jack never regained his eyesight. Penrod Dean wrote and published his book ‘Singapore Samurai’ after ‘Mac’ had died. He was unable to dispute several points Dean published. 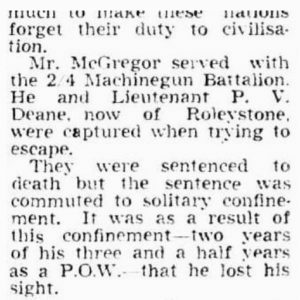 Chris Neilson, another POW at Outtrim was in the cell next to Mac – Neilson taught Mac morse code enabling a long friendship to develop, means to exchange of news where it was totally forbidden to speak, and a life-line in the god-forsaken Outrim. 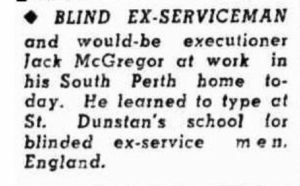 (Dean claims he taught Mac morse code, which is not true, and much as he tried Dean was not successful in learning himself).